Dillian Whyte: Tony Bellew is a Coward, Very Bitter, I'd Smash Him! 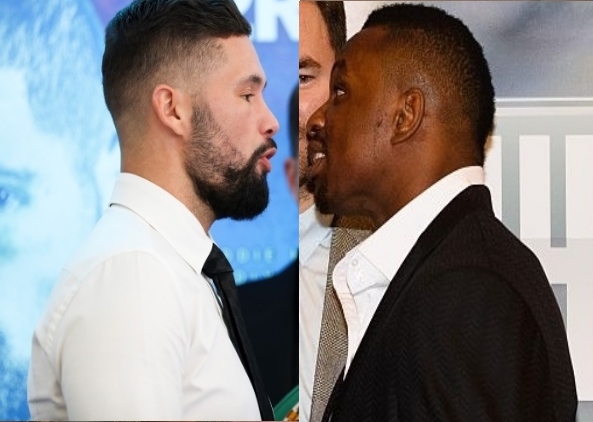 Heavyweight contender Dillian Whyte has once again lashed out Tony Bellew. The two British heavyweights have traded words on several occasions in the last few weeks. This past weekend, Whyte dominated Robert Helenius over twelve lackluster rounds in a clash for the WBC silver title. The fight was part of the Anthony Joshua vs. Carlos Takam undercard from Principality Stadium in Cardiff. After the contest was over, Bellew (29-2-1, 19 KOs) was very critical of Whyte's performance. He feels the once-beaten boxer is not ready to face someone on the level of WBC heavyweight champion Deontay Wilder. Whyte (22-1, 16 KOs), after hearing the statements that were made by the former WBC cruiserweight champion, was furious. The statement from Bellew have struck a nerve with Whyte, who claims that he will fight him for no money at stake - at least on his end. Bellew returns in December in a bitter rematch with David Haye at the O2 Arena in London. "Tony Bellew is a very bitter man and he is a coward," Whyte told talkSPORT. "I have offered to fight Tony Bellew for free on numerous occasions. This is a man that was getting knocked out at super-middleweight and at light-heavyweight. He is not a true heavyweight. "Tony Bellew is scared to fight me, he is scared to fight Anthony Joshua, he is scared to fight Deontay Wilder. I am not scared to fight any of these guys. That is the reason why he feels he needs to bad-mouth me. "If he is a real man, let him fight me. I want to fight him and beat up him just to show him he is not a true heavyweight. He will get smashed." I have said publicly before I will fight him for free and I will stick to that. He can have all the pay-per-view, all the revenue for the gates, everything. I just want to make a statement. It is one fight in my career I am willing to make a statement on." Whyte would beat Bellew. That's how horrible Haye become. [QUOTE=alexguiness;18177059]Whyte VS Bellew is a 50/50 fight IMO. I'd actually prefer to watch this than the Haye re-match. [/QUOTE] No, Whyte murders him. Whyte is a true hw.